Reptiles vs Amphibians Worksheet – Download our easy science kids free printable worksheet and discover what is the difference between reptiles and amphibians. This free printable science worksheet includes a fun search a word puzzle and a hidden words game for kids. Kids will enjoy to learn fun facts about Reptiles vs Amphibians with this worksheet. The reptiles and amphibians worksheet is both free to download and free to print. Our easy science worksheet about reptiles amphibians is suitable for Preschool kids, Kindergarten kids and Elementary school kids from Grade One to Grade Five. Elementary school kids can benefit from the reptiles vs amphibians easy science worksheet as a reading comprehension exercise. Kids learn well as they will need to read and re-read the reptile and amphibian facts to find the missing words. This exercise will not only improve their memories but also their reading skills. Preschool kids can use this free science kids printable worksheet about reptiles and amphibians as a listening comprehension game. Parents or Educators can read out loud the facts about reptiles and amphibians and then ask their kids what the missing words are. Young kids can also enjoy playing the word seek game and learning to recognize letters and words in the words puzzle. Teachers and Educators can use our easy science kids free worksheets to supplement science lessons, special education programs and after school science activities for kids. Parents can use this worksheet to spend quality time educating their kids about reptiles and amphibians and awakening their curiosity and interest in science. Our easy science facts for kids website offers many great free science kids printable worksheets to download. With our worksheets you can make learning science fun for kids! What is the difference between reptiles and amphibians? Are there any reptile and amphibian similarities? Some reptiles look frightening but some people like to raise them as pets. Learn more fun facts about these creatures by downloading the free reptiles and amphibians worksheet for kids! [sociallocker]Download the free science kids worksheet about Reptiles and Amphibians. Download the FREE Reptiles vs Amphibians Worksheet for Kids! Did you like the FREE Reptiles vs Amphibians Worksheet? For more lengthy info, click here. Declan, Tobin. " 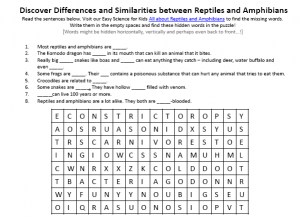 Reptiles vs Amphibians Worksheet - Easy Science Kids Free Printable Worksheet - ." Easy Science for Kids, Apr 2019. Web. 23 Apr 2019. < https://easyscienceforkids.com/reptiles-vs-amphibians-worksheet-easy-science-kids-free-printable-worksheet/ >.